"Art+Reconciliation" was conceived as a MOOC (albeit an unusual one) that addresses how artistic practices can engage in questions of reconciliation, most particularly in the Canadian context of residential schools and the associated and ongoing Truth and Reconciliation Commission. 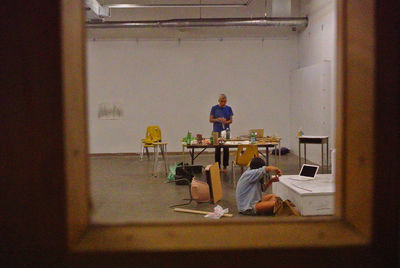 As part of our process we explored the history of the residential school system in Canada, discussed strategies of creating and increasing an awareness of Indigenous practices and histories from Aboriginal and non-Aboriginal perspectives, engaged in a critical inquiry of the Truth and Reconciliation Commission on Indian Residential Schools, and all the while thought through how artistic media can be a driving force in this articulation. 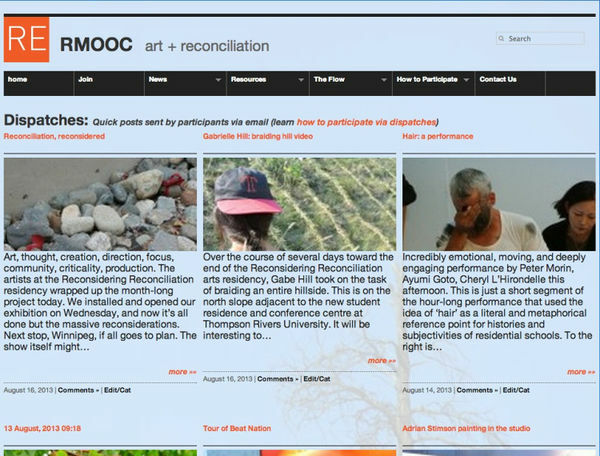 Our ‘course’ began July 15, 2013 and the first segment, incorporating the ‘Reconsidering Reconciliation’ arts residency in Kamloops, ran til Aug 31. The second phase ran through to Sept 30, 2013, with a rolling registration so participants could receive our updates. There were various manners by which viewers could partake, explained in the how to participate in this site via social media and tools we built that allowed various forms of contribution to the experience. rmooc is officially closed as an ongoing and maintained site, but will be reinvented as an archive and database that will likely take on new life as we all proceed with this work. By their nature, MOOCs are alternatives to mainstream education — they are often free (as is ours) or inexpensive compared to their face-to-face counterparts; they can have dozens, hundreds, even thousands of participants (ours is currently at about 90 with ongoing and rolling registration); they can boast a variety of assignments and online events that are part of the end result of the course (ours is a bit different in that it functions more like an online learning/sharing platform than a defined course with ‘instructors’ and students’, but this is not totally out of context for connective moocs). But mostly, MOOCs can give access where before there was little or none. Many of our subscribers, by their admission, feel a bit isolated in their ideas, their communities. This is not to say they have no like-minded souls in their spheres, only that the multiple directions of this discourse on art/reconciliation can feel rather scattering. By amalgamating many creative producers and productions on rmooc.ca, we hope to bring a larger sense of unity, solidarity, to a concept that might be fruitful in the days ahead. The "Dispatch Hub", which featured work submitted by participants by email, converted then by WordPress into multimedia posts. This page was last edited on 7 February 2014, at 11:55.